"William Bloom is a British leader in the mind-body-spirit field with more than 30 years of practical experience, research, and teaching. He is the founder and co-director of the Spiritual Companions Project in the UK, a training in a multifaith and holistic approach to spirituality and pastoral care. He is also a meditation master and author of several books. When Bloom asked a class on the new spirituality what it meant to them, they pointed to the following: compassion, consciousness, self-awareness, love, quest, death of self, trust, discernment, openheartedness, wholeness, full connection with God, self-respect, care and healing, peace, harmony, simplicity, letting go, understanding, freedom, and wisdom. "Connection: your heart is touched and you connect with the wonder and energy of life. Reflection: you pause and reflect on your life and actions, and ponder how to change and improve. Service: you have a clear sense of what is right and what is wrong, and you act so as to do good for others. There is an ethical undertow to these three spiritual practices which encompass traditional values, green values (protect and care for the natural world), psychological and emotional values (love, respect, and affection), and presence (radiate benevolence) Bloom acknowledges that those questing for a new spirituality want to integrate it into their daily life at home, at work, and in community. To help facilitate that process, he presents exercises on determining the best gateways, discovering your distinctive spiritual style, and deepening your spiritual connection. In his discussion of the role of reflection as one of the three golden keys to spirituality, Bloom takes a hard look at awakening, self-management, and the changes of spiritual growth. Some of the major obstacles to the transformation we seek are depression, the monkey-mind, conditioning (bad habits), yearning to maintain the status quo, enslavement to the many stories we tell ourselves, and desire as a form of suffering. In the section of the book devoted to service, Bloom salutes all those who in the name and spirit of spirituality seek to make the world a better place by helping and supporting others, by doing good as a part of the universal flow, by acting in honesty and humility, and by caring for the natural world. Everyone has religious experiences; most people just don�t know how to identify them, says author William Bloom. Carolyn Myss calls this well-known British Body-Mind-Spirit teacher a �genius� who finally �separates spiritual reality from New Age nonsense.� His Power of Modern Spirituality uniquely straddles mainstream and alternative forms of belief. In commonsense, everyday language, Bloom speaks directly to the legions of people who seek to replace a single-faith tradition with a more generalized spirituality. He identifies the core similarities in all spiritual traditions and explains how everyone-regardless of background, beliefs, or personality type-can immediately put them into practice. He shows how to develop the key aspects of connection, reflection, and service in the context of today�s challenges in order to gain greater meaning in our lives. He also explains the phenomenon of spiritual voices in a psychological context, and he explains how modern spirituality�s ethical core is stronger even than that of traditional faiths because it includes green values and insights from developmental psychology. 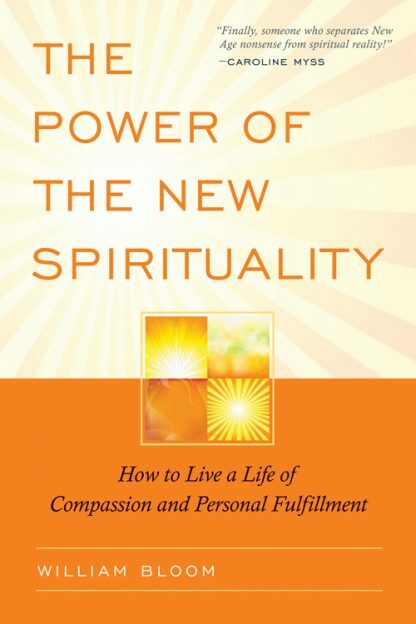 Written in a lively and inspiring style and drawn from Bloom�s popular workshops, The Power of Modern Spirituality helps us explore ourselves more deeply. It is an invaluable tool for increasing a sense of integrity, inner strength, and personal joy. It will also help us connect more strongly with family members, friends, and colleagues and forge a sense of being in the driver�s seat of our lives. Today�s society makes ever-increasing demands on us. But in the practice of modern spirituality, we can find heartening new solutions that give us the energy, motivation, and inspiration to develop ourselves and transform our world. William Bloom is Britain's leading author and educator in the mind-body-spirit field with over thirty years of practical experience, research and teaching in modern spirituality. He is founder and co-director of The Foundation for Holistic Spirituality and the Spiritual Companions project. His mainstream career includes a doctorate in political psychology from the London School of Economics, ten years working with adults and adolescents with special needs, and delivering hundreds of trainings. His holistic background includes a two-year spiritual retreat living amongst the Saharan Berbers in the High Atlas Mountains, 25 years on the faculty of the Findhorn Foundation, and co-founder and director for 10 years at the St. James's Church Alternatives program in London. Bloom is also a meditation master and his books include the seminal The Endorphin Effect, Feeling Safe, and Psychic Protection -- and most recently Soulution: The Holistic Manifesto. His books are translated into sixteen languages. William Bloom lives in Somerset, UK.